Last trip was in July 07, next trip should be July 08. Love this place. Started from the end of the bus line. Went up stream to the sign that says "you need a permit", then to a side canyon until it got too technical. Fun! Don't know why it took me so long to visit Zion N.P. I have had some great hike but this was the best. All the way through with Tanya this year. Out and back from the end of the Zion Canyon road. Not as cold as I was afraid it would be, but I was glad to have my neoprene socks. Was only able to go a short distance because I had to be back to meet the rental car guy who was bringing a spare key to unlock the trunk where my keys got locked in. An amazing place and high on regrets not being able to spend more time. 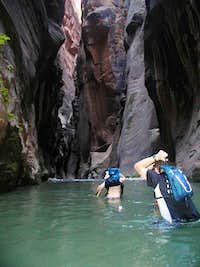 Driven through Zion National Park on several occasions, but this was my first hike. And what an amazing one it is! Didn't see a sole the entire hike in. Feet finally went numb due to the icy cold water after about a mile. Made it to Big Springs just as the sun started to directly hit the water in mid day. Turned around here and passed by at least 25-35 other hikers. I suggest an early start like I did if you want the solitude and majestic Narrows to yourself. Been there a few times, never tried to complete the entire route. Did about a 1/4 of it on July 25, 2009.
wow! what a nice place. surreal. breathtaking. i wont forget this day. I've been in the Narrows a few time's. Never done it from the top, but from Orderville Canyon, twice. Did 17 mile trip from ranch through Narrows in May - water levels much lower than I experienced once before (Sept 8 1993). Normal? Started at 10 AM and really boogied because we were afraid of dark. Got in before night with longer daylight. Was delight. 3rd time doing 17 mile route from ranch. Water level difference of few inches (compared to Spring) is difference between awesome and awesome ordeal. This time it meant finish in darkness (with 6 AM start - too many photos?) and two days learning how to walk again. But still totally, awesomely, worth every stumble. didnt have the time to go as far as I wanted ... but saw enough in the 3+ miles I did go thru to make a lasting impression! Went several miles then down the orderville slot. Was unlike anything i've done and loved it. Rather cold in the darker morning, but in the afternoon sun a nice jump in is perfect on the way back! My Sister, Dad and myself did this one a few years back. We didn't do the whole canyon, didn't know there was a shuttle going to the upper part. But we went a few miles in. Definitely going back though!